This mini-obsession with BBQ started with the Digital Mission trips to SXSW and has surfaced again as we prepare to take 40 companies to this year’s mega-conference in Austin, Texas. One of the happy by-products of the trip is the chance to indulge in some of the best BBQ available. Start with the harder ingredients – black peppercorns and coriander seeds – and pound them into powder using a pestle & mortar, then start adding in the softer ingredients. 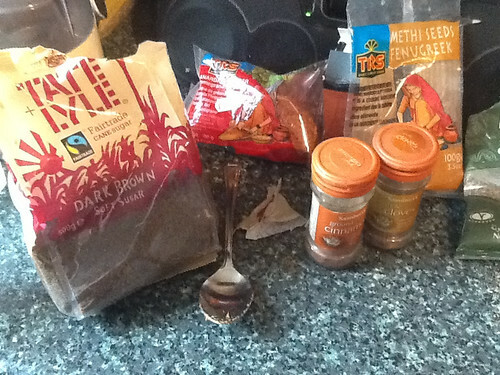 If you can get whole ingredients rather than powder, I think the flavour is better. Took me about 10 mins of heavy-duty pounding to get a reasonably fine powder for the rub. It could definitely be finer still, but I’m quite lazy. 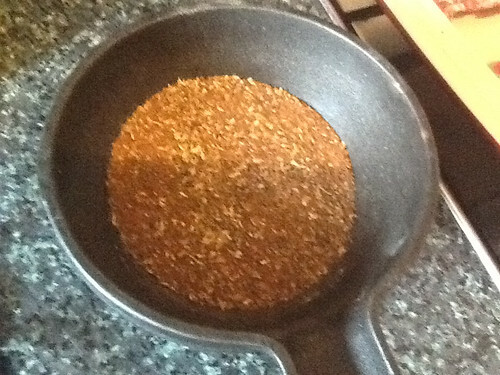 A tip here…use the weight of the mortar to crush the spices, if you use arm action alone, it gets tiring quickly. Now time to add the mix to the ribs. Take the tough membrane off the underside of the ribs, if it’s still there. Most butchers will have done this already. Don’t worry too much about fat. Fat is good. Keeps everything juicy and lovely. And with this length of cooking time, much of it will cook off. At least that’s what I tell myself. Doctors may disagree. 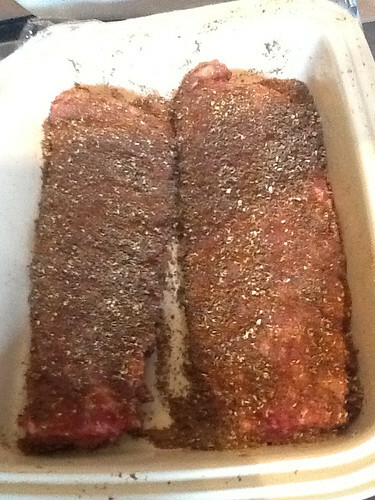 Spread evenly across the ribs and make sure the meat is covered. Scoring the underside of the ribs where there’s a little more fat helps to get the flavours into the meat. 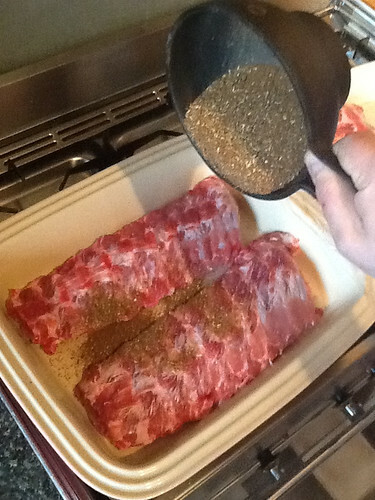 Once you’re done, the ribs should be evenly covered and the texture feels like silky wood shavings. Then it’s time to wait. Boo. Cover with clingfilm and pop into the fridge for a while. In this experiment, I left them alone for 2.5 hours. Time to cook. Almost. 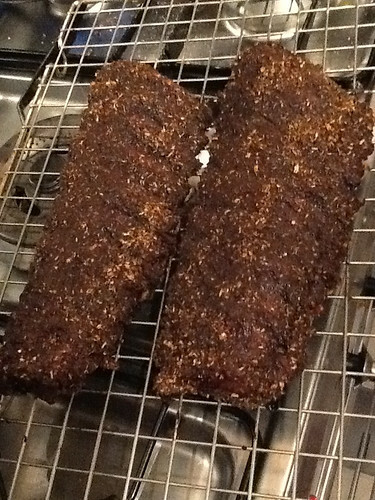 Whip the ribs out of the fridge, remove clingfilm and let them come up to room temperature. This can take a while. 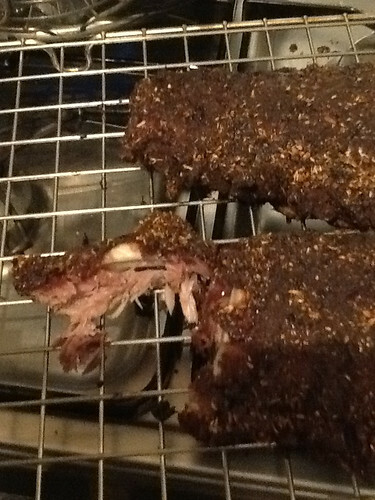 But it’s worth it…that’s extra time for the dry rub to work it’s magic. 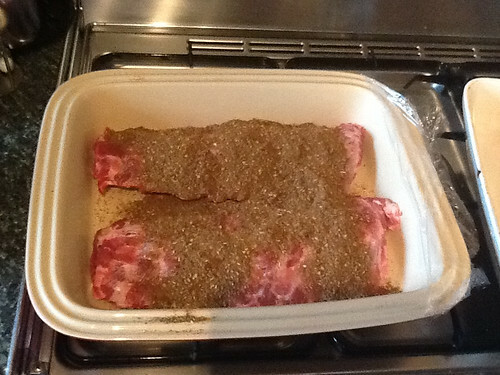 Whilst that’s happening, pop the oven on to 100C ready for the ribs. For the cooking, low and slow are the by-words here. 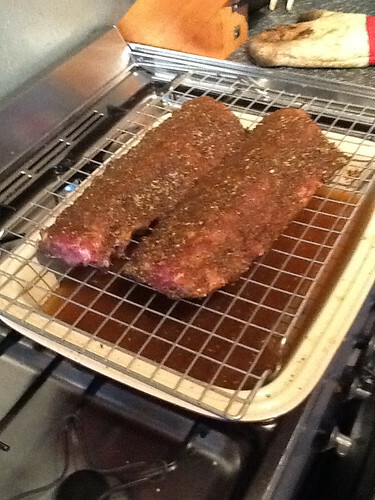 I like to pop the ribs on a rack above an oven dish that’s filled with water. This helps keep the ribs moist as they cook. Give them a while – 3-4 hours. And eat! Took us about 20 minutes to wolf down the whole lot. We tried them with a couple of different BBQ sauces, but in the end, I prefered them sauce-less. Let me know how you get on. Photos (cc) Sam Michel. See the set on Flickr.